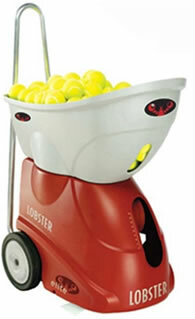 In early 2018 Mount Pleasant purchased a new tennis ball machine: the Lobster Elite Grand 4. The machine is battery operated, and currently there is no electricity in the storage shed so we charge the battery in the clubhouse. Is the main switch (hidden down below the control panel on the left side, near the wheel) in the UP position? DOUBLE CHECK POWER IS REMOVED - this means disconnect the battery completely. Now carefully put your hand in through the feed wheel and try to pinch the threads on the ball, and pull it out. If this fails, put the machine back and let Dee know. Is the trip-switch off? This can happen if a ball was stuck in the machine. The trip-switch is down under the control panel, on the opposite side to the main switch (near the other wheel). Try to flick this on and see if it helps. Are the leads correctly attached to the battery? Look inside the black bag holding the battery. Sometimes the leads can come loose. The black lead should be connected to the black terminal on the battery, the other to the red terminal. If these were not connected properly it may not be charged. Finally: if the battery fails for you, and if the charger was showing a green light before you started, please let Dee know. The battery may need replacing.